The atmospheric clubhouse overlooks the 1st tee and 18th green with great views of players starting and finishing their rounds. It was opened in 1912 but has recently been refurbished. There are excellent facilities for members and visitors alike. The proshop allows visitors and members direct access to the clubhouse and has a back office where our head pro is often to be found. Downstairs there are men’s and ladies’ locker rooms with lockers available for visitors. The office houses our administrative staff and is where you will find Laura and her team who are very happy to answer any queries you may have. There is also a large meeting room which is hired out for special events to members and non members alike. It is also used for some of our social functions such as bridge and art classes. Upstairs (there is a lift) the large lounge, dining room and balcony all offer superb views over the course and a smaller back bar. Many social events are staged by the Club over the year and the facilities may be hired for private functions. 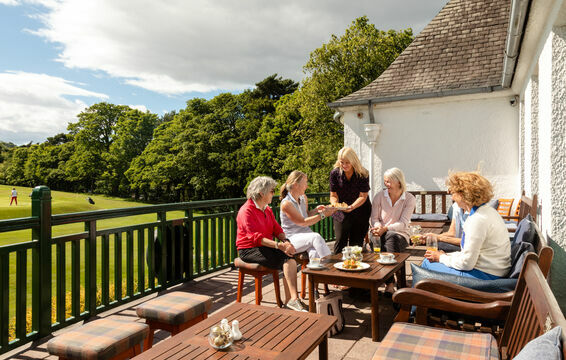 The comfortable and relaxing surroundings of our Clubhouse are perfect for enjoying that refreshment with your friends while you discuss your round! We welcome you to Murrayfield and hope that you enjoy your golf and our hospitality. Bar closes 30 minutes prior to Clubhouse.